As Republicans and Democrats search for a plan to avert a fiscal cliff, it's looking more likely that the payroll tax cut will expire. The payroll tax cut that boosted paychecks for millions of working Americans over the past two years may be on the brink of extinction. As Republicans and Democrats search for a plan to avert a fiscal cliff, it's looking more likely that the payroll tax holiday introduced under President Obama in 2010 won't be extended. Should this benefit expire, 125 million households would see their paychecks shrink, the Tax Policy Center estimates. That's a far bigger slice of the population than the group of Americans who would be affected by proposed income tax hikes. 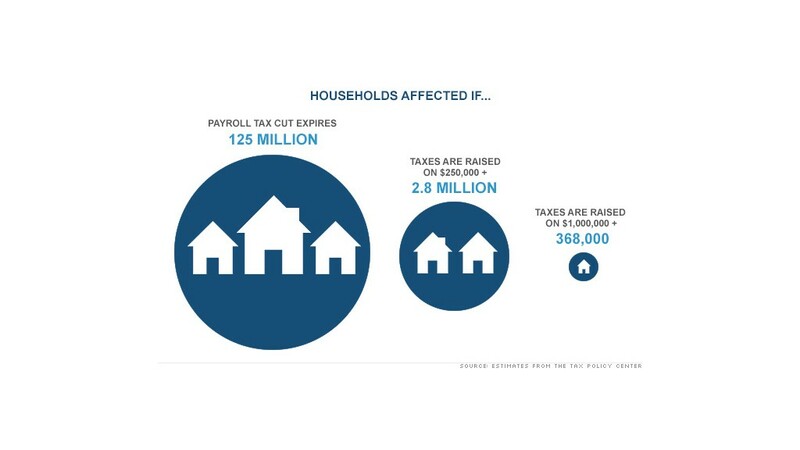 If taxes are raised on incomes exceeding $250,000, roughly 2.8 million households would be impacted. Meanwhile, a mere 368,000 Americans would feel a tax hit if rates rise on incomes above $1 million. Letting the payroll tax break expire shouldn't come as a big surprise: Obama introduced the payroll tax cut as a temporary measure to stimulate the economy. But nothing is set in stone, and a revival of the tax break -- or some form of it -- isn't out of the question. If it does expire, the payroll tax rate would revert from 4.2% to 6.2% on the first $113,700 in earnings. "It would pull money out of peoples' wallets, and for a lot of folks, that really matters," said Roberton Williams, a senior fellow at the Tax Policy Center. Someone making $100,000 would receive about $167 less in their monthly paycheck -- or $2,000 per year. A $50,000 income earner would see their paycheck drop by $83 a month -- or nearly $1,000 a year if the payroll tax cut expires. And it continues to get smaller, with someone earning $30,000 losing $50 from their monthly paycheck. While losing $50 a month may seem negligible to some people, it still adds up to $600 a year -- a sum many low-income families can hardly afford to lose. "The people who are going to feel it the most are people making minimum wage to about $15 an hour, because they're the ones who are just getting by," said John Lieberman, a CPA at Perelson Weiner LLP. "Two percent of someone's income is a lot of money when you're only making $400 a week." Expecting a raise? If the payroll tax cut isn't extended, a big chunk of your salary hike will likely get wiped out. Since the average raise for 2013 is expected to be 2.9%, roughly two thirds of that increase would be eaten up by the 2% reduction in paychecks due to the expiration of the payroll tax. That means the worker earning $50,000 would be left only $450 better off after receiving a $1,450 raise. Meanwhile, a raise of $2,900 for the $100,000 earner would result in a net benefit of $900. Businesses are also worried about what this reduction in pay will mean for consumer spending -- and their bottom lines. "People will spend less, and it will affect the economy," said Lieberman. How would an expiration of the payroll tax cut impact you? E-mail blake.ellis@turner.com for the chance to be included in an upcoming story on CNNMoney.com.